A lot of us know people who it seems are just set on causing mischief and trouble, and to this type of person it is a way of life. Scripture calls them rebellious and wicked as the fear of God is not in them. (Jeremiah 5:22-26). Fear ye not me? saith the Lord: will ye not tremble at my presence, which have placed the sand for the bound of the sea by a perpetual decree, that it cannot pass it: and though the waves thereof toss themselves, yet can they not prevail; though they roar, yet can they not pass over it? But this people hath a revolting and a rebellious heart; they are revolted and gone. Neither say they in their heart, Let us now fear the Lord our God, that giveth rain, both the former and the latter, in his season: he reserveth unto us the appointed weeks of the harvest. Your iniquities have turned away these things, and your sins have withholden good things from you. For among my people are found wicked men: they lay wait, as he that setteth snares; they set a trap, they catch men. It is as a game being played to a fool who is full of mischief; they spend their days trying their best to set people up. Those who are wise are aware of their behavior and are not taken in their snare and trap. (Proverbs 10:23-25). 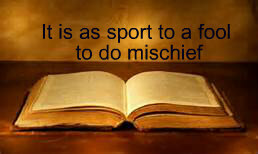 It is as sport to a fool to do mischief: but a man of understanding hath wisdom. The fear of the wicked, it shall come upon him: but the desire of the righteous shall be granted. As the whirlwind passeth, so is the wicked no more: but the righteous is an everlasting foundation. El’-y-mas the sorcerer who was trying to turn the deputy from the faith was full of mischief and deceit and was unaware Saul who was full of the Holy Spirit knew what he was doing. (Acts 13: 8-12). But Elymas the sorcerer (for so is his name by interpretation) withstood them, seeking to turn away the deputy from the faith. Then Saul, (who also is called Paul,) filled with the Holy Ghost, set his eyes on him. And said, O full of all subtilty and all mischief, thou child of the devil, thou enemy of all righteousness, wilt thou not cease to pervert the right ways of the Lord? And now, behold, the hand of the Lord is upon thee, and thou shalt be blind, not seeing the sun for a season. And immediately there fell on him a mist and a darkness; and he went about seeking some to lead him by the hand. Then the deputy, when he saw what was done, believed, being astonished at the doctrine of the Lord. Could the way we live really bless or curse us?